Casa Melita is an authentically 400 year old house of character situated in the historical village of Rabat. This beautiful 3 bedroomed house, which has been recently restored to include modern comforts lies in a peaceful pedestrian road close to St Paul parish church and village core. All the downstairs rooms surround a sunny courtyard, with barbecue facilities and full privacy. The ground floor includes a wide entrance hall, a fully-equipped separate kitchen and dining area and a lovely lounge/ living room, complete with satellite television. There is also a guest toilet on the ground floor. Access to the first floor is through an internal stone staircase. On the first floor you'll find three double bedrooms, one with ensuite bathroom facilities. The main bathroom is also found on this floor. Access to the roof terrace is through a wrought iron spiral staircase. 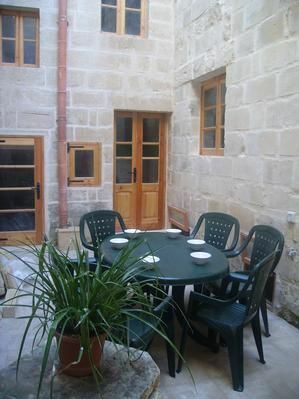 On this floor you can enjoy a lovely roof terrace from where you can admire the surrounding old and peaceful villages. This rustic house is beautifully furnished and delightfully blends antique and Swedish-pine furniture.